Directly hard-wired into your brain is the sense of smell. When you smell an odor or fragrance, this is transmitted to your olfactory bulb which is in the part of the brain responsible for memory and emotion. Whether pleasant or unpleasant, this scent can recall a memory. Therefore, a smell can subconsciously trigger feelings of nostalgia or a deep emotion. The smell of fresh bread might transport you back to your grandmother’s kitchen or the scent of pencil shavings might evoke memories of your third-grade classroom. If scents can be gratifying and positive, how can you harness this as a caregiver? Can you benefit from the calming sense of smell? Can your parent relive some memories with the aid of scent? The answer is yes, and it need not be complicated or expensive. 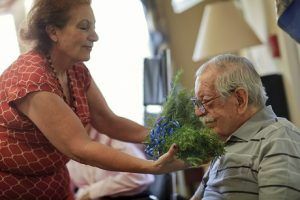 Using scent as a caregiving tool can be as simple as looking in your cupboard, cutting fresh flowers from the garden, or buying an inexpensive scented candle. It can be done in minutes when you grind fresh coffee beans or dab perfume on your mother’s wrists. It is being aware of your surroundings, enjoying the smells you encounter throughout the day, and taking a deep restorative breath. Relax. Research has shown that the scent of baby powder can reduce stress. This scent can evoke the safe and secure feelings of childhood or the happy memories of motherhood. Add this to your mom’s bathing routine to indulge in this comforting scent. Another easy item you can pick up from the drugstore is suntan lotion. The familiar coconut scent can induce feelings of relaxation from a vacation at the beach. Energize. Caregiving is hard work. If you are feeling sleepy in the afternoon, don’t grab another cup of coffee or a sugary caffeinated soda but try popping a peppermint. This powerful menthol scent can open up your sinuses and help you feel alert. Citrus is another refreshing scent to make you feel energized. Try scents of lemon, orange, or grapefruit to combat stress and fatigue. Reminisce. There are many scents that evoke positive memories but are personal to you or your parent. Perhaps your dad spent his Sunday afternoons tinkering under the hood of his car, so he enjoys the smells of the garage. Maybe it’s the aftershave that your grandfather wore, the detergent that your mom used, or the scent of snow hanging in the air that takes you back. These scents are personal and can change your mood. Keep a catalog of these personal scents. At Aegis Living, we believe in the power of scent and its positive impact on our residents and staff. We have created a proprietary scent for our communities designed to help relax the body and calm the mind. Almost undetectable, this subtle blend of chamomile, lavender, and other complementary ingredients reduces stress and anxiety. We also use a diffused aromatherapy scent as part of our Comfort Touch, caring touch program. When you take a tour of our community, see if you can smell this calming scent for yourself and ask about our Comfort Touch Program.